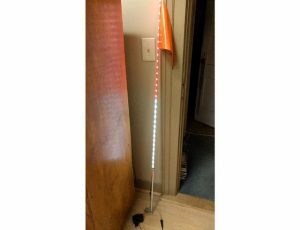 I have had a great time making and selling my Pixel Pole product on Tindie. I thought I’d share a few experiences along the way. First of all, this whole idea came about as I was trying to find a fancy light display for our robotics team. I ordered a meter of RGBW NeoPixels and built up a shield for an Arduino Uno to work with them. I’m still using it for program development. But what’s a Pixel Pole? Well, it’s a strip of NeoPixels and an Arduino circuit to run them. It runs off a battery and is intended to be attached to a bicycle flag pole for enhanced visibility. It’s a niche market, but I’m a part of the niche, so I had no problem getting the word out about them. 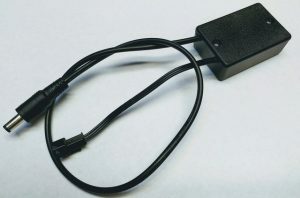 I have an entire page about the ins and outs of the battery packs here. I have none left. I have no more parts either. I don't plan on making any more. In fact, I made the first one for myself and mentioned it on Facebook in the Recumbent Trikes Group. Before I knew it, I had people asking how they could get one. Eventually, I decided to look into making a few. I went out on a limb and started ordering parts. I eventually looked into getting a PC board made and found a place that did inexpensive 3-board runs as long as they were a certain size. I found I could fit my design onto that size board five times, so I could cut them up and get 15 boards. I learned a few things about making PC boards the hard way. I used some surface mount parts to keep the size down and didn’t leave quite enough clearance around the electrolytic capacitor. I also found out the size holes that ICs use are smaller than what header pins fit. But I was able to work around all that and the next run of boards will solve those and other problems. Parts sources were all over the place. Where I’d normally order a single piece from a more expensive domestic source, I relied on overseas (China) sources for some of the parts and ordered in quantity. I tried to get the price down low enough to be realistic and still cover all my work. Some things took a while to arrive. Think the proverbial slow boat from China, while others were surprisingly fast. I occasionally order things from overseas and for one or two items, the shipping is free. But if you order a dozen, it can be as much as the items. but I initially ordered enough parts for 10, then had to order more to finish the last 5. I wasn’t sure how I was going to sell them at first. Direct to the person? EBay? 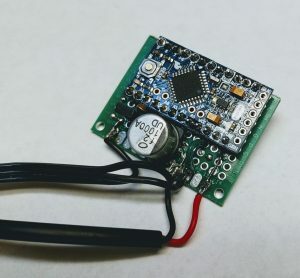 I finally remembered Tindie where I had bought something before. It’s kind of a Etsy for Makers and specializes in tech projects. They even encourage sharing the plans or a tutorial. I set up a seller page and got ready to sell. Once all the parts arrived and I had everything completed, I turned it on and posted again on Facebook. I put an ad on the Recumbent Classified page and everything took off. I sold the first 10 out in a week and I rushed to get the last 5 boards done. They were gone in less than two weeks from the start. I apologize, I totally missed your message to me. I’m sure it was because I filed a report is why you couldn’t. accurate to a certain degree so they can only give me three addresses on the street it was delivered to. Just now my neighbor came over to drop something off. At my front door was the package! I don’t know if somebody at one of those three houses figured out I was there looking for it or not but I do have the package. I will let the Postal Service know. The package appears undamaged. So please don’t put anything in progress and consider this a case closed. Thank you very much for answering my emails and ready to stand behind a product. So that crisis was solved. The difference between Priority Mail and just Parcel Post was not that great. Closer addresses would have been cheaper by parcel post, but west coast would have been just as much. For the insurance and tracking, PM was worth it. The only negative issue I had was some a$$ on Facebook who kept leaving comments about how he could buy “the same thing” on EBay for $20 and I was charging too much. First of all, what he was showing was not nearly as capable as what I offered, nor was it well suited for a bicycle. But the real issue was, you don’t do that. You don’t go talk trash about what someone is selling in Recumbent Classified. I tried to tell him so but he kept it up. The moderator had deleted a couple similar comments earlier, and although I tagged him in a reply, I didn’t want to ask him again. This was right when the first 10 had sold out, so I simply marked the item sold, which removes it from view, then made a new ad for the last 5. So, the next question is, will I make more. I don’t know. I’m thinking about it and there seems to be demand. But I’m going to wait a bit. For one thing, I haven’t received a penny yet for the ones sold. I’ve spent around $300 on parts and won’t order more until I get paid for the first set. Tindie has a policy for new sellers where they hold the money for 30 days to protect the customers from scammers. It gives people time to complain if someone is ripping them off. I knew about this up front, so I am not complaining and support their policy, but as far as diving in deeper to order more parts, I’m going to wait it out. 30 days will be the end of July, so it’s not too long. So that’s my venture into entrepreneurship.